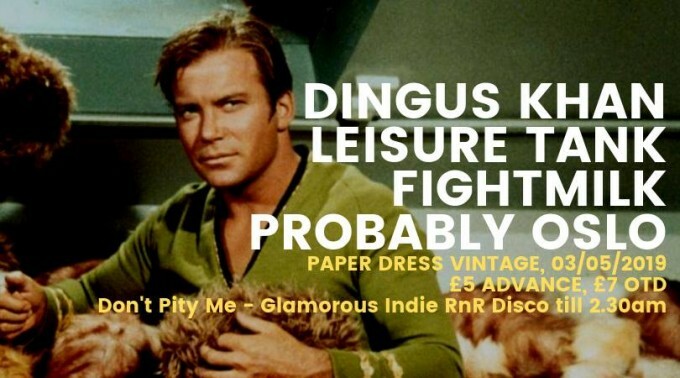 Dingus Khan, Leisure Tank, Fightmilk + more! Indie Rock n Roll takeover with scene heroes DINGUS KHAN back in action for their first London headline show of 2019! Joining them are indie rock power trio Leisure Tank, Fightmilk & Probably Oslo and after the live music The Caress are hosting a Glamorous Indie Rock n Roll Disco till 2.30am! Leisure Tank is a indie rock power trio from London NW – expect raw & minimalistic analogue rock with unpredictable song structures and heavy, danceable grooves. Loud shouty power pop 4 piece! Combining sharp, earnest songwriting with the beguiling melancholy of early 80’s guitar pop. Drawing influence from the likes of The Smiths, Orange Juice and The Cure, alongside contemporaries Real Estate, Swimming Tapes and Rolling Blackouts Coastal Fever – Probably Oslo have conjured an intoxicating sound calls upon intricate, hypnotic guitar licks, lush stacks of vocal harmonies from the band’s three vocalists and an urgent rhythmic energy.